Fugijen (FGN) Guitars are a Japanese guitar manufacturer that are probably not that well known to most, although they have built guitars for other well-known brands such as Ibanez and Fender, and Epiphone. FGN Guitars are now branching out with their own line of guitars, and distributing them around the world. FGN have a wide range of models, with some paying homage to some famous designs, and others being unique to FGN Guitars. Thanks to Music Connection, FGN Guitars Australian distributor I have a FGN Guitars Neo Classic NCLS10RP to review. 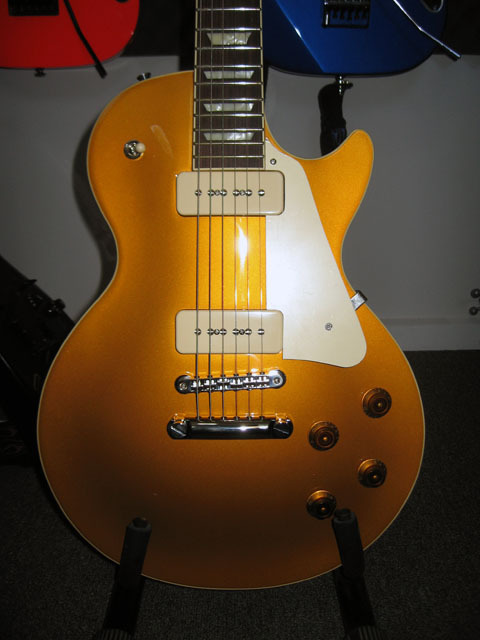 This particular Les Paul style guitar has a beautiful antique gold finish, and is loaded with P90 pickups. Without looking at the headstock this guitar looks very much like a classic gold-top Les Paul, and is built much in the same way. With a two piece mahogany body with maple cap, set one piece mahogany neck, and rosewood fretboard everything about it seems very much like a traditional Les Paul. It definitely sounds much like a traditional Les Paul, but other than the headstock there are a few things that make this guitar unique. The most important difference is FGN Guitars proprietary Circle Fretting System (CFS). Traditionally guitar and bass frets are completely straight. This is a compromise made on guitars resulting in slightly off intonation, but easier to install frets. FGN Guitars have come up with a way to cut and fit slightly curved frets, shaped like a slight smiley face when looking directly at the fretboard. FGN Guitars believe that the curved frets enhance pitch accuracy, and in turn provide longer sustain and better harmonics. This particular guitar was quite heavy, much like one would expect from a Les Paul, even with some chambering done to the body it’s still quite a weight to hold. The grain on the back of the body was quite pleasing to the eye, and the antique gold finish is almost flawless. There was a little over-spray onto the neck binding where the neck joins the body, but it’s not noticeable unless you look really closely. On the subject of binding, there were a few scratches along the neck binding, obviously from filing the frets into shape. Nothing too major though, I’ve seen much more expensive Les Pauls with this. The fretwork was quite nice, with no sharp edges. The crowns were finished well, and were nice and smooth to play on. The NCLS10RP comes with vintage style tuners, which I’m not a big fan of. They get the job done, but I prefer more modern designs as they feel more accurate and consistent with their movement. The tune-o-matic bridge and tail piece are all high quality Gotoh items. 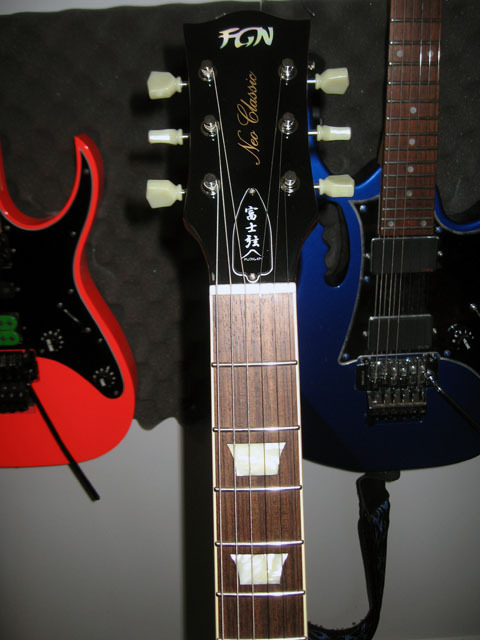 Out of the box the NCLS10RP was nicely set up with lovely low action and minimal fret buzz. The fretboard looked like it was probably a 12” radius, and provided a perfect balance of playability for both rhythm and lead playing. The neck is nice and slim, and felt very much like an Ibanez Wizard II neck, which I quite like. I suffer from carpal tunnel syndrome, and find that my hand cramps on necks that aren’t fairly thin and D shaped. The NCLS10RP caused me no grief what so ever. The CFS frets were not at all hard to get used to either. In fact, I didn’t even notice that they were curved until I read up on the CFS frets, and looked really closely at them. Unplugged the tone was typical Les Paul stuff, nice fat mellow tone and great sustain. The tone was loud and full, and open chords rang out in a particularly beautiful way too. The NCLS10RP comes with both humbuckers and P90s loaded with ferrite magnets for high output, the model I reviewed had the P90s. I’m not usually a fan of P90s, as I prefer humbuckers for their tone, and low noise. 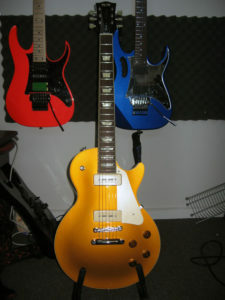 In saying that I found the P90s on this guitar particularly good. Some P90s can be very noisy due to their single coil design. The ones installed on the NCLS10RP were particularly impressive as not only did they have quite a bit of output, but were also fairly quiet at high gain settings. They also cleaned up quite nicely when the guitar’s volume was rolled down. I found the bridge pickup to be very vocal sounding with a pronounced mid-range bark. With distortion it sounded particularly good for hard rock and punk rock rhythms. Soloing on the bridge pickup with some distortion provided nice sharp tones without getting too twangy or thin. The neck pickup was nice and thick, jazz players would probably love it. It provided lovely thick singing tones on clean and dirty settings when soloing above the tenth fret. The middle position was a nice blend of the two pickups, and was particularly nice for clean rhythm tones. One thing that seems a bit odd at first is that the NCLS10RP comes with a gig-bag rather than a case. This is soon forgotten when you look at the quality of the gig-bag. It is nice and padded, made with a sturdy outer material, great shoulder straps, and a few pockets for storing your bits and bobs in. I liked it so much that I’d love a couple for my Ibanez guitars. Overall the FGN Guitars NCLS10RP with P90s is a beautiful instrument, and a great alternative to the guitar it is styled after. The build quality is definitely high, and the couple of small flaws I found were in no way going to affect how well the guitar played or sounded. It’s a great sounding guitar for rock, hard rock, punk, blues and jazz. It could probably do country quite well too. I’d imagine the humbucker equipped model would be more than capable of providing some great metal tones as well. If you are looking for a high quality, set-neck single cut guitar that plays, and sounds as good as the real deal, but with a more wallet friendly price the FGN NCLS10RP is definitely worth checking out. A big thanks to Sam at Music Connection for providing me with the FGN Guitars NCLS10RP to review.